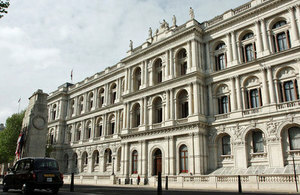 Ministers met to discuss developments in region as well as key elements of the bilateral relationship. UK Minister for the Middle East Alistair Burt and Israel’s Deputy Foreign Minister Danny Ayalon held a productive meeting in Jerusalem today to discuss developments in the region including the renewed contacts between Israel and the Palestinian Authority under the framework of the Quartet statement of 23 September 2011. The ministers also discussed key elements of the bilateral relationship, including rapidly increasing trade figures, the shared goal of building a UK/Israel partnership in high tech, and ambitious plans to strengthen UK-Israel scientific collaboration. The Ministers reflected on the situation across the region, a year since the start of unprecedented changes taking place in the Arab world. They discussed in particular the threat posed by Iran’s nuclear ambitions, especially in light of Iran beginning to enrich uranium to 20% at the Fordo nuclear enrichment plant. Mr. Burt updated Mr. Ayalon on British plans to step up economic pressure through tougher sanctions, including on Iranian oil and the UK’s previous action to sever financial ties with all Iranian financial institutions including the Iranian Central Bank.